A BASH (Bird Aircraft Strike Hazard) is a collision between birds and planes. Usually windshields or in the blades of the jet. These usually happen during take off and landing. The size of the bird is a factor. While canadian geese average 3 – 13 pounds eagles average 9 – 13. However, there are a lot more canidian geese in this area then eagles. Also flocks of birds are more dangerous. While the eagles do not fly in flocks the canadian geese do. With this said the rate of accidents due to bird incidents are fairly low percentage. Usually the bird is the loser in the collision. Jet engines are designed to shut down after an ingestion incident with a bird. The engine does not have to survive but shut down in the theory the other engines are working. This is why a flock can be so bad as it would target more than one engine. Airports take a number of tactics in removing geese and other birds. I have seen golf carts run along runways before take off and shoo off birds. Other ways are Pyrotechnics, dogs, or remote control model type planes to scare the birds off. Also they change the design of the area such as remove trees where birds hang out . Make sure no grass fields. My point being unless Norfolk is planning on running off all birds and paving over everything then they are really making a big deal our of removing a few of one type of birds which won’t help a lot . And I agree with Vivian so what will they do when they destroy the nest and the birds build new ones . I am pretty sure they just won’t shoot them while they may not be on the endangered list anymore( I am not sure if they are off) I am sure the citizens of Norfolk would never allow that to happen. As you know I think this is a big mistake. My common sense approach of asking to delay this for one year and consider all options was ignored. In the end the Eagles will get the last laugh. Break Dad Norfolk’s territory and result-four or five new nesting pairs! ORF has an existing wildlife management plan in place but obviously it isn’t very effective with the death of 2 Bald Eagles in 2011 and an Osprey eariler this month but yet with all their studies they’ve been doing it was concluded the net needs to be extended futher from the airport. Maybe ORF needs to concentrate on what’s going on in their own backyard rather than what’s going on on their neighbors property. I understand the concern…no one wants to see another accident but obviously what they’re doing now isn’t very effective. The USDA can kill what’s there now but nature will replace them in time….how much killing has to happen before man realizes there’s only but so much he can control? I found this blog by searching for the property lines of Norfolk Botanical Garden of all things and I thank you for what you’ve said. I also want to thank Mr. Smigiel for speaking out at the council meetings although it fell on deaf ears. I do not blame the City of Norfolk for what they had to do, I blame them for their ignorance for what these Bald Eagles represent. Removal of the nest is not going to guarantee there will be no more bird strikes. Using dispersal techniques are not going to guarantee there will be no more bird strikes. Many airports use many different dispersal techniques and still have bird strikes and sometimes crashes with loss of life. Going into court and saying to the lawyers representing the crash victims and their families — “we cannot be held liable because we did this, this and that to try to prevent bird-strikes” — is going to be met with rounds of belly aching laughter. After the lawyers are done laughing they will still sue– because their motto is — someone has to pay! In order to avoid big payouts by sympathetic jurors in a trial… the city, the airport and the airlines will settle with the plaintiffs for horrendous amounts of money. I am NOT saying they should not use dispersal techniques but facts prove they don’t work 100% of the time and bird-strikes still happen anyway. When a bird-strike causes a plane crash with injuries or death, lawsuits are inevitable. The use of dispersal techniques or the removal of ONE EAGLE’S NEST will not protect a city, an airport, or an airline from lawsuits. Apologies to new posters here for the delay in your comments showing up. you will have more on your hands to deal with than a pair of eagles . How can using paint balls on eagles (which is part of the dispersal plan) be a logical, reasonable or a humane way to discourage these majestic eagle birds from rebuilding at the Garden, if Norfolk does remove the nest? I can think of other targets for those paint balls, and I’m not talking about birds! I do not want to see another eagle hurt by a plane, nor any human injuries or deaths. However, the City of Norfolk and the airport needs to man up and admit the methods they have used do not work. Birds will see the people coming to fire guns and other dispersal equipment and just hide out until the danger has passed. The City of Norfolk is about to throw tax payers money to the wind and in the end will have to admit, as other airports have done, that these tactics do not work. The FAA has placed Avian Avoidance Radar Systems in other airports and these systems are used by the Air Force at major bases and have also sent one to Afghanistan to protect their aircraft from migrating birds. This is used in conjunction with patrolling the runways and learning where the birds are usually by way of a lap top in their vehicle, as well as reports on what kind of wildlife, and when they are most likely to be on airport property. The City of Norfolk and the airport should set an example by using their money wisely and not caving in to scare tactics. Thank you Vivian for pointing out another good point in regards to flocks verses one or two eagles. I agree that it would be great if they came to your land and built a nest. 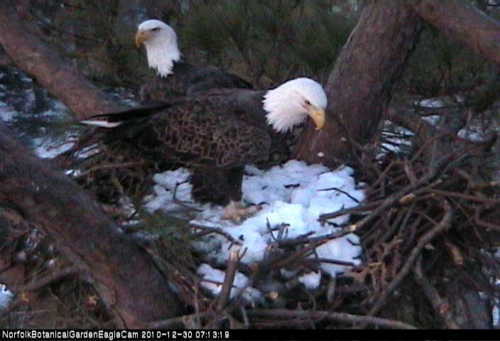 I came to Norfolk for the first time last year all because of three eaglets that many fell in love with. I had many intentions of coming back this fall when we go on a business trip to Kentucky because you have such a great city and we did not to get to see it all last year. I feel so bad for NBG and the people that work there and will keep trying to support them regardless. When did the government start running us, “we the people “? I thought government officials were supposed to at least listen to the the majority and not be so closed minded…. Looks to me like there needs to be some severe house cleaning of city officials, both city and airport, they were voted it, they can be ousted out! We need more open minded compassionate people like both you Vivian Paige and Tommy Smigiel. Why is it they can’t see that this is not the solution… I could not agree with you more Ms. Paige and you Mr. Smigiel! This is one tourist that is canceling her Norfolk trip this spring based on the out come of this nest! Perhaps Ms. Paige could get Mr. Hancock to recount the advice he gave to these homeowners to make one particular tree inviting for the eagles. Then we could keep our fingers crossed that it works! I think we can all agree that no one wants to see an accident between wildlife and aircraft. But I agree that further studies and implementation of more proven methods should be used by ORF. Removing the resident eagle from the NBG just doesn’t seem to be the best option. We know he will return this is his territory. As I was reading part of the 133 page report on the study that was done over the past year, I was disturbed to see that they want to increase the area covered from 3 miles to 5 mile radius around the airport. How are they going to cover that much territory including a golf course and private property? Can they displace wildlife from private property (legally)? I would have a real problem with this, I would be displacing anyone coming in on my property. If the solution seems to be to cut down trees, fill in ponds, put down pesticides to keep beetles from hatching and if that doesn’t work use lethal methods (except for eagles which can only be harrassed unless miss identfied). Seems to me the only fessible option for them is, before they put in an airport they should buy up all the land 5 miles around the area cut down all the trees, bulldoze it flat, apply pestcides to keep vegitation from growing and without a water source near by. What in the world has happened to being good stewards to this earth and coexisting with wildlife? It is man that has created these problems not wildlife. We encroach on their habitat every day wildlife adapts for once maybe we should adapt to wildlife. My Fellow Americans, When will we learn that our wildlife was here before us. It was their world BEFORE we took it from them. We, the smarter of the two, must learn to co-exist with them. Are you going to tell me that we cannot find a way? Someone out there MUST be smart enough to find a way for man and wildlife to live together peacefully. As the years go by, we keep pushing them back, paving over THEIR land, KILLING their food source, destroying their water supplies, and now we want their skys! When will someone find a way? No one wants to see a human or a animal hurt or worst. Moving one or two American Bald Eagles will not solve this problem. It’s like saying, if you take two people out of a crowd, it is no longer a crowd…..Many other things have been tried, and have failed. It is time for us to find a new way to perserve our wildlife. Come on people, put on your thinking caps……………research and find a resolve, something that works for everyone and everything. It was man who made the problem and made some of these animals endangered………..now that they have begun to come back, we want to get rid of them AGAIN?. Will we NEVER learn?????????????? Take your time, get the facts right, find a way, I know that you can do it. Do it for our beloved eagles, do it for all wildlife, and do it for all of man. I also agree that removing the eagles nest is not going to solve the problem. The airport needs to make the airport safer, not push the burden off to the City of Norfolk. The Eagles were here first and deserve to be treated with respect and humanely as all wildlife should be treated. Let the biologists and experts who understand the situation have time to work on a solution. Trying to keep birds out of the garden is fruitless and a waste of tax payers money. I am from Chicago and have been to Norfolk 4 times in the last six years. It is a beautiful garden and the Bald Eagles make it special. Let them keep their home! I agree with requesting a delay to study other options. Norfolk Airport has not applied their wildlife dispersal plan with due diligence. Cam watchers and garden visitors have seldom heard their propane cannons – which are supposed to be part of their plan. Wildlife quickly adapts to changes so while the noise may initially discourage the eagles they will become acclimated and ignore it. They have adapted to all that noise from planes. There are other means of protecting the flying public including radar systems that should be tried before the City of Norfolk starts harassing the bird that represents freedom in this country!